A bolt on spring anchor point which will allow individual return spring adjustment similar to what can be found on other brands of pedal steel guitars. Bracket that will allow you to mount 2 knee levers inboard of the rear rail. This bracket may also be positioned anywhere you have room. Fits most all pre-1985 MSA pedal steel guitars. Bracket that will allow you to mount a right hand knee lever with a reversing link, inboard of the rear rail. Delrin bushings to fit early model (Pre-1985) MSA pedal steel guitars. Shouldered Delrin bushings to fit the pedal pull on early model (Pre-1985) MSA pedal steel guitars. Shaft mount knee lever clamp for early model (Pre-1985) MSA pedal steel guitars. Body mount swivel knee lever clamp for early model (Pre-1985) MSA pedal steel guitars. New style MSA foil adhesive backed decal. This is the one used on the face of the pedal bar. The new style has block lettering instead of the script lettering on the '1985 and earlier. The chess piece is also reversed from the older style. 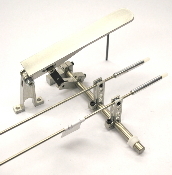 Knee Lever for early model (Pre-1985) MSA pedal steel guitars. Vertical Knee Lever to fit early model (Pre-1985) MSA pedal steel guitars. Reversing Link to fit early model (Pre-1985) MSA pedal steel guitars. Acorn Nut for covering the thread on the shoulder bolt which attaches the RKR to the rear rail on MSA pedal steel guitars. Also used on the pivot screws that attach the knee lever to the shaft bracket. #10-32 Jam Nut for various applications on pedal steel guitars. 2 hole Bellcrank (Rod Pull) to fit early model (Pre-1985) MSA pedal steel guitars. 4 hole Bellcrank (Rod Pull) to fit early model (Pre-1985) MSA pedal steel guitars. Pedal Pull link to connect the pedal rod to the shaft. 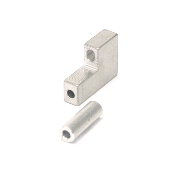 Stainless steel Link Rod that is Ø1/8". 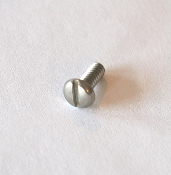 Pan Head Slotted Screw used primarily on the Pre-1985 MSA's to secure the sheet metal tab of the pedal pull. Socket Head Set Screw used primarily on the Pre-1985 MSA's to secure the Pedal Axel in the pedal. 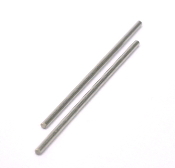 These are Alloy Steel #10-32 x 3/16" long. 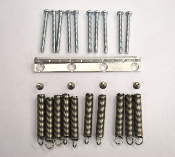 Price is for 1 package of 10 screws. 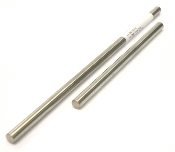 Cross Shafts to fit MSA pedal Steels. Pedal Support Shaft for Pre-'85 MSA pedal steel guitars. 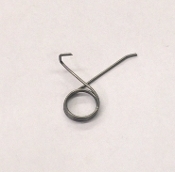 Finger Return Spring for Pre-1983 MSA guitars. Pedal Return Spring for Pre-1983 MSA guitars. Pedal Support Bracket to fit Pre-1983 MSA pedal bars. 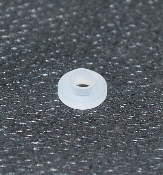 Washer, Nylon, Ø.505 ID, Ø.750 OD, .032 Thick Rod, Pedal, Ø3/16"
Nylon washer for MSA Changers. These washers are used between the finger assemblies. Actual thickness varies between .032-.036". Packages of 11 or 13 washers.